The Rolex Submariner Date in 18 kt. Yellow Gold, the original diver’s watch. The 40 mm watch case is made of 18 kt. 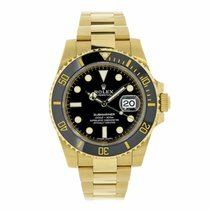 yellow gold housing the Rolex self-winding mechanical movement and is water resistant up to 300 meters/1,000 ft. Beneath the scratch resistant sapphire crystal is a black dial with bright luminescent markers and a date display at 3 o’clock accentuated with the Cyclops magnifier. The unidirectional bezel has the blue insert. The bracelet is the signature three piece Oysterlink in high polished and brushed 18 kt. yellow gold securing on the wrist with the fold over Oysterlock safety clasp. The watch comes with Rolex Box and Avi & Co Appraisal, 2 year movement warranty.